February 6, 2014 - Ralph Kiner, an original voice of the New York Mets and Lifetime Member of American Sportscasters Association, died on February 6, 2014, of natural causes. He was 91. Born on October 27, 1922 in Santa Rita, New Mexico, Kiner was a stand out baseball player as a youngster. He signed a minor league contract with the Pittsburgh Pirates in 1942 and after serving in the U. S. Navy during World War II, he made his major league debut in 1946. A feared power hitter, he led the National League in home runs the first seven years of his career. His 54 homers in 1947 fell just two short of Hack Wilson’s then NL record. Unfortunately, a back injury forced the six-time All-Star into retirement at the age of 32, finishing his career with 369 home runs and 1019 runs batted in. 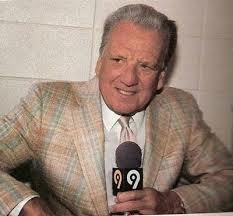 Kiner began his broadcasting career in 1961 with the Chicago White Sox. A year later he became an original voice of the expansion team New York Mets alongside Lindsey Nelson and Bob Murphy on WWOR-TV Ch. 9 and never looked back. His 53 years with the Mets was the third longest streak for an active broadcaster with a single team behind only the legendary Los Angeles Dodgers voice Vin Scully (64 years) and the Dodgers’ Spanish-language pioneer Jaime Jarrin (55 years). To say that Kiner was a fan favorite is an understatement. He was a master storyteller who captivated his audience, not to mention an occasional malaprop which gave them a laugh or two. "The Mets have gotten their leadoff hitter on only once this inning," he once said. Or introducing the next Mets batter as “Gary Cooper," instead of Hall of Fame catcher Gary Carter. Another fan favorite was his post-game show, “Kiner’s Korner, which debuted in 1964, the team’s first year at Shea Stadium, where Kiner would chat with the star player of the day. Aside from his baseball notoriety, Kiner was known to rub elbows with Hollywood legends Bing Crosby, Frank Sinatra, Bob Hope and Jack Benny, as well as dating leading ladies Janet Leigh and Elizabeth Taylor. Among hs many honors, Kiner was elected to the National Baseball Hall of Fame in 1975, the New York Mets Hall of Fame in 1984 and had his uniform # 4 retired by the Pittsburgh Pirates in 1987. In 1998, Kiner was a finalist on the ASA’s Hall of Fame ballot, with the honor that year eventually going to NFL announcing great Pat Summerall.